It is too bad the late, great James Garner never got to take this Polaroid camera out for a spin. It has been specially modified. The big bulky mainframe spits out a picture of whatever is in its field of vision, twenty-four hours into the future. Unfortunately, its inventor no longer has a future, which allows his underachieving neighbors to put it to dubious employment in Bradley King’s Time Lapse (trailer here), which opens today in select markets. Finn fancies himself a painter, but he is really just the super of a suburban condo complex. He is the guy who has to check up on the eccentric Mr. Bezzeredes when the retiree’s papers start piling up. His girlfriend Callie is a writer who works as a waitress and their housemate Jasper is basically a degenerate gambler. It turns out the former scientist was compulsively snapping photos through their front window before he met with death through some mysterious form of misadventure. From Bezzeredes’ journal and the evidence of the photos, the trio quickly deduces the nature of his breakthrough and concludes he was burned (literally) because he tried to pull a fast one on time. Therefore they resolve they must always conform to whatever future comes spitting out of the machine or suffer the consequences. Of course, it always seems to provide Jasper the daily winners at the racetrack. It also shows Finn the paintings he had been struggling to produce. We do not need a crystal ball to predict Jasper’s bookie will get suspicious when he keeps picking race after race. However, that is just the start of the complications for the trio. For one thing, they essentially lose all free will once they commit to conforming to the nightly 8:00 photo. It becomes a compelling dramatic constraint King and co-writer B.P. Cooper wriggle in and out of quite cleverly. 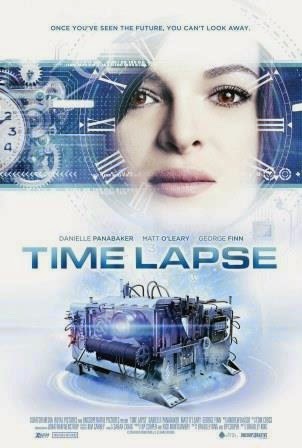 In fact, Time Lapse represents a continuation of the renaissance for low budget, high concept indie science fiction, successfully following the example of James Ward Byrkit’s Coherence, Hugh Sullivan’s Infinite Man, and Darren Paul Fisher’s Frequencies. Like those films, Time Lapse is not about special effects. Instead, they start with a fantastical Macguffin and trace its effects on realistic, everyday people. 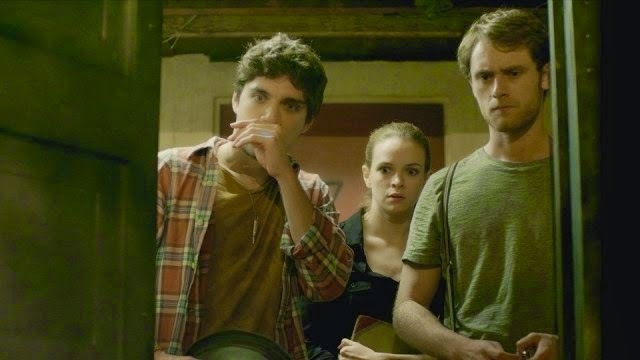 Arguably, Time Lapse is the most character-driven of the lot, presenting the dark side of a Three’s Company-like situation. Danielle Panabaker is terrific as Callie, pulling off some nifty pivots that really make the film. George Finn also relishes Jasper’s increasingly erratic behavior, chewing scenery like a genre pro. Matt O’Leary sort of draws the short straw as the painfully reserved Finn (the painter character), but he holds up his end, keeping the action moving forward. One of the cool things about Time Lapse is it is the sort of science fiction film you could adapt as a stage production without it suffering from a lack of SFX mumbo jumbo. Tightly executed by King, it is a worthy addition to the growing time travel canon. Recommended with a good deal of enthusiasm, Time Lapse opens tomorrow (5/15) in Los Angeles at the Arena Cinema and also launches on iTunes.